Next time you’re shopping for jeans, you could be helping out….genes? It’s true! The Holt Renfrew fundraiser Jeans to Save Genes this weekend will be doing just that- putting money towards whooping crane research here at the zoo. 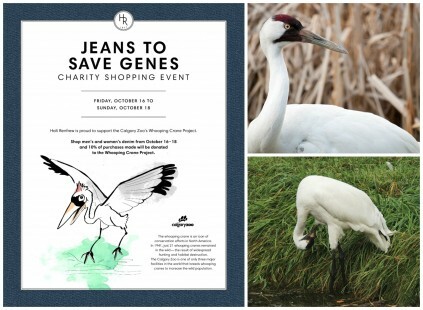 Holt Renfrew is helping us shed light on our whooping crane conservation by hosting their second Jeans to Save Genes fundraiser this year. The plan is simple- stop by Holt Renfrew anytime from Friday, October 16, to Sunday October 18 and go shopping for jeans. Purchasing a pair of jeans (men or women’s) during this fundraiser will donate 10% of the proceeds towards whooping crane conservation! Not only will you be donating, but if your jeans cost $200 or more, then you will be given a free individual admission pass to the zoo. Why is saving whooping cranes so important? These fine looking birds are a major focus of the Conservation Research department at the Calgary Zoo- not only are whooping cranes a famous species in Canada, but there are also in need of our assistance! In the 1940’s, something distressing happened- the wild whooping crane population dipped to only 21 individuals worldwide. Realizing something had to be done, organizations across North America starting working to help recover the species. 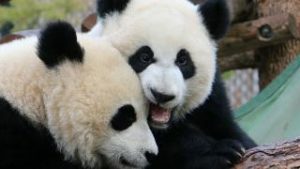 With the combined efforts of the Calgary Zoo and other conservation organizations, the wild population is now approximately 600 individuals and increasing. We’re proud to say that since 1989, the Calgary Zoo has been part of the captive breeding program for this iconic Canadian Species. So not only can you shop for your fall wardrobe this weekend at Holt Renfrew, but you can also give back to the Canadian conservation community- one fantastic pair of jeans at a time. Be part of the Jeans to Save Genes movement and make conservation your style. Learn more about the efforts to conserve whooping cranes here.